Book a session by clicking the link below. Sessions must be booked online at least 24 hours in advance by existing clients only. New client? If so, please email me at healthyfeetnbody@gmail.com or call me at (206) 335-1329 to schedule your first session. – After your fifth full-price session, your sixth hour is just $60, a 90min session is just $80, and a 120min session is just $110! – Have a birthday coming up? 60min sessions are just $60, 90min sessions are $80, and 120min sessions are just $110 during your birthday month, it’s time to celebrate your awesomeness! Pre-paid Package of Five Sessions – Save $75 with your purchase! Packages are non-transferable, non-refundable, and expire after nine months from purchase date. Give the gift of health and relaxation! Just click on Store and select the option you wish to purchase. Then contact me at healthyfeetnbody@gmail.com and let me know the recipient’s name and address where I can send it. "Working with Melanie has been powerfully healing and rewarding. Not only is Melanie easy to trust and feel comfortable with, she is also extremely knowledgeable and experienced in her field of massage. When I come to Melanie I know that she will listen and respond to my needs the best she can and I always leave feeling cared for, relaxed and as though I can move through my day with less pain and more ease and balance. As a health care practitioner myself, I feel confident to refer any patient to Melanie for massage and reflexology knowing they will be in good hands and receive the highest quality of effective therapeutic care." - S.N. 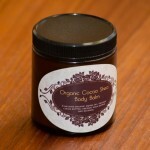 In all my sessions I use my Organic Cocoa-Shea Body Balm. I make the body balm using organic ingredients I buy from producers here in the Pacific Northwest and Canada. Receive my email newsletter with health tips, easy self-care routines, info about my work, and more! Opt-out of tracking your visitor data through Google Analytics Click here to opt-out.